Find phlebotomy training classes in Virginia below! Medical institutions and other healthcare teams depend on phlebotomists to procure quality specimens from patients in order to have a dependable lab analysis result. Therefore, phlebotomists should create an ambiance of confidence and trust with patients while collecting blood samples in a reliable, safe and skillful approach. Through the Phlebotomy Technician program offered by Germanna Community College, phlebotomy students can gain these skills and more. The whole program consists of 160 hours of lessons. It costs approximately $1475 which does not include fees for supplies, health insurance, books, liability insurance, and criminal background check. This phlebotomy program rigorously trains the students to become exemplary phlebotomists in their field of work. The class size is small to foster a better learning environment. In order to be accepted in Germanna’s Phlebotomy program, applicants need to meet and furnish the program application requirements. Norfolk State University in Virginia provides exemplary teaching to the community through empowering individuals with skills and information that they need to become productive citizens. The university provides outstanding academic programs related to different types of industries. One of the programs that they offer is phlebotomy training which requires students to attend 60 classroom ours and 80 hours of clinical practicum. This training program provides information to aspiring phlebotomy students on how to collect, process, and store blood samples from patients under different clinical settings. The cost of the program is $1,150 - not including books - and it starts from September and ends in November or during the summer semester. The East Coast Polytechnic University in Virginia is one of the premier schools that offer a phlebotomy technician program. The university caters to students from all walks of life. It provides a supportive and conducive environment with small class sizes so that instructors can focus on their students and deliver quality lessons. The phlebotomy technician program provides instructions on how to collect, process, as well as distribute laboratory specimens. It also provides instructions on safety standards, legal and ethical behaviors and how to work with patients and other healthcare professionals. Students are required to complete a 60-hour classroom instruction and 80 hours of clinical externship. The entire classroom instruction is completed within 10 weeks while the clinical externship takes another 12 weeks. Students who complete the course are eligible to take the national certification exam by the American Society of Clinical Pathologists to become licensed phlebotomists that can work under different clinical settings. Aspiring phlebotomists in Virginia can take the Certification in Phlebotomy program offered by the Virginia Western Community College. This community college provides accessible, affordable and quality educational opportunities to all types of people. The school provides a comprehensive educational program for aspiring phlebotomists. The curriculum is designed for entry-level phlebotomy technicians thus students will learn basic and modern techniques in venipuncture as well as how to process, analyze and store blood samples. Moreover, students are also taught how to interact with patients and other healthcare professionals like doctors and nurses. Students are required to complete classroom instructions and laboratory training before they are eligible to take the clinical externship. Both classroom and laboratory instructions take a few weeks to complete. As soon as students complete the program course, particularly the supervised clinical practicum, they are eligible to take the national certification exam given by the American Society of Clinical Pathologists. The Northern Virginia Community College offers a certification program to aspiring students who want to study phlebotomy. The program is designed to prepare students on how to collect, process, and store blood samples for medical analysis. The curriculum also provides learning experiences for both on-site and in affiliated laboratories. For students to be admitted in the program, they need to attend the phlebotomy information session organized by the Northern Virginia Community College before the beginning of the term. Students also need to have a high school diploma with a minimum 2.0 curricular GPA. The course is comprised of 11 credit units which can be completed within one semester. Students are required to complete the classroom instruction with a grade of C or better before they can proceed to the clinical practicum. 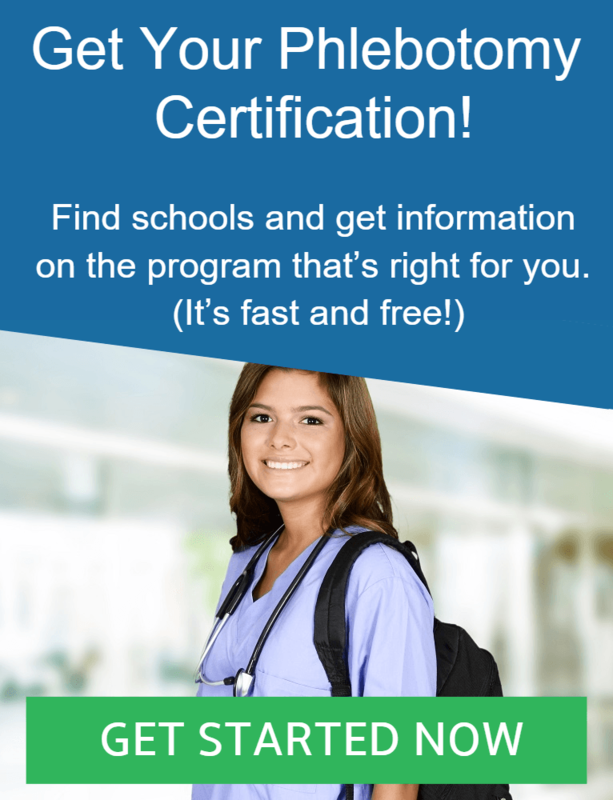 Once students complete the necessary requirements, they are now eligible to take the national certification exam so that they will become certified phlebotomy technicians. The exam is organized by the American Society for Clinical Pathology Board of Certification. The American School of Nursing and Allied Health (ASNA) aims to serve aspiring individuals within the Washington Metropolitan area. It specializes in nursing education as well as other careers in the health care industry such as phlebotomy. Phlebotomy technicians collect, process, store and analyze blood samples used by doctors as a diagnostic tool to make decisions. Students who enroll in the phlebotomy program of ASNA can find employment in different healthcare settings like hospitals, assisted living homes, and nursing facilities. The phlebotomy training program is only conducted for 8 weeks which include classroom instructions, simulated laboratory experiences and clinical experience wherein students are taught comprehensive knowledge and skills related to blood collection. They will also be exposed to different challenges in working in different medical environments thus ensuring that they become competitive and efficient phlebotomy technicians once they graduate. Once they complete the course, students can take the national certification exam to become certified phlebotomy technicians.